Steel Card Insert Base - Stacy, Minnesota - Wyoming Machine Co.
A customer in the commercial and service machinery manufacturing industry recently contracted with us for a card input base plate laser cutting project after hearing our reputation for quality, cost-effective results. This card base input plate is used in the manufacturing of a piece of equipment that produces financial and identification cards. 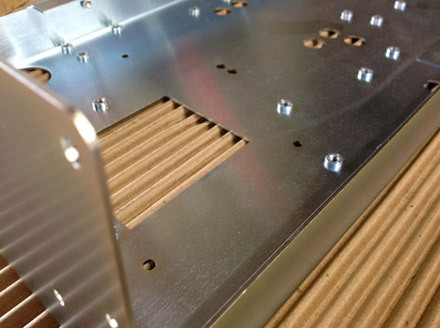 The laser cutting utilized our 4,000 watt CO2 laser and 125 ton CNC-controlled press brake. It also tapped our forming, bending, and reaming capabilities to form the cold rolled steel part. Measuring 29.21" long x 8.91" wide x 3.75 inches high, with tolerances of ± 0.005" and angular tolerances of ±1⁰. 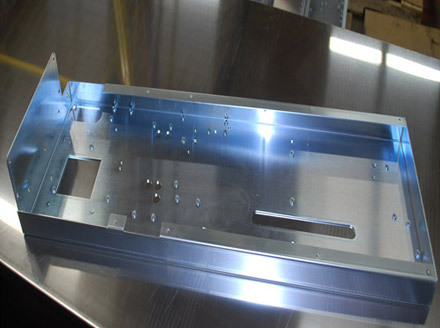 Within 4 weeks, the base plate was zinc plated, dimensionally and visually inspected, and delivered to the customer. 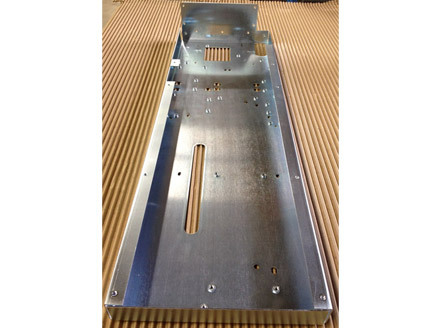 The final product exceeded the customer's expectations and resulted in an order of 400 base plates per year. Let Wyoming Machine cut your steel, aluminum, copper, nylon, rubber, plastic, and more. Contact us today to learn more.